We took three photos of this caterpillar. 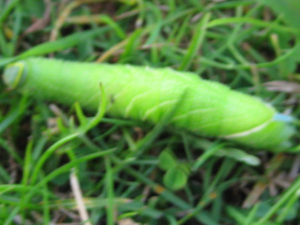 We found it on the mown grass near Loughton Lodge lake in Milton Keynes, UK. Although it looks really well camouflaged as a rolled-up green leaf, it stood out because it was nothing like the leaves of nearby trees and was a very vivid green. It was about the size of an adult's little finger. It has what looks like a blue spike on its head. We've got a video as well, but I couldn't upload that here.